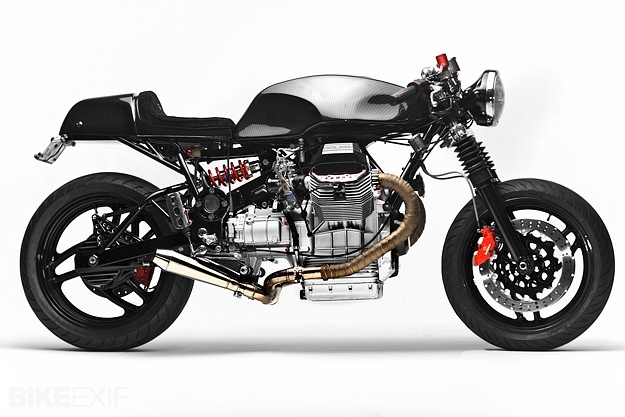 When I think of a Moto Guzzi custom, I think of a Le Mans. It’s one of the all-time great custom platforms, along with the Honda CB750, Triumph Bonneville, Yamaha SR series and Kawasaki W650. 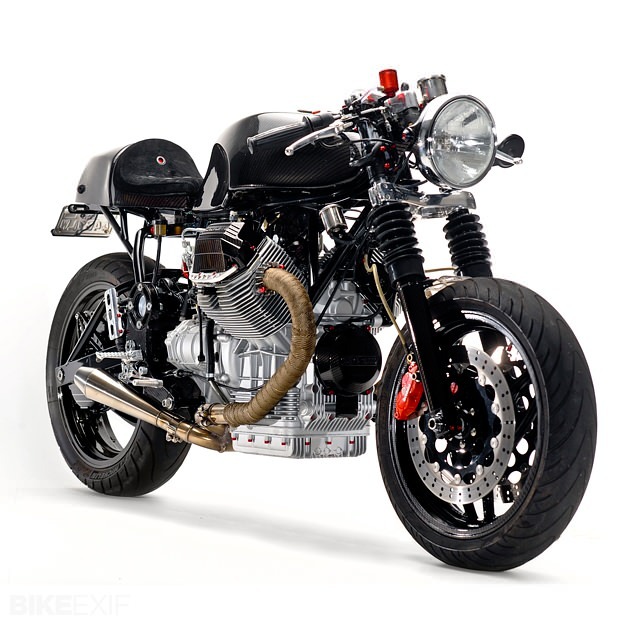 This classic-looking Guzzi cafe racer, however, is based on a 1996 V1100 Daytona—an altogether more powerful bike, with 102 bhp from its 1064cc motor. It’s the latest build from Alain Bernard of Santiago Chopper, and Bernard has nicknamed the machine ‘Weight Watcher’ because he’s stripped all the fat from the stock bike—both visually and literally. A new sub frame accommodates a Ducati seat unit, and a new battery box holds a tiny lightweight Antigravity battery. The fairing and bulky standard instruments are gone, and the stock tank is replaced by a carbon fiber-wrapped item created by Grace FX Hydro Graphics. New stainless steel pipes and Keihin CR 41mm carburetion give the engine a power boost. The headlight is from a Kawasaki, and the taillight is an almost invisible LED. The bike has also been completely rewired, and treated to an engine and frame refinish from Craig Paints Bikes. Even the bolts and fasteners have been replaced, using anodized fittings from Pro-Bolt. The result is brutal and elegant in equal measure. I’d put it in my garage in a heartbeat—wouldn’t you?